Rainbow House | Fit Family Robinson | The world is your gym. Exactly 6 months from the day when our family took a fated road trip to Santa Barbara on December 28, 2013 that changed our lives, we are back on the road heading to California once again as a family. We have been given an opportunity to stay at a beautiful home in CA so Brett and I can focus on writing our book and start test filming on location workouts. 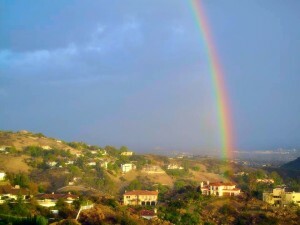 The “Rainbow House” is a magical place allowing us to let the inspiration flow as we travel through some wonderful and hard moments that will be included in our co-written memoir. The photo of the Rainbow House is the real deal…no photoshop. Gotta love it! I’ve been dancing around to “I Can See Clearly Now” ever since we found out we would be staying here. “I can see clearly now the rain is gone.